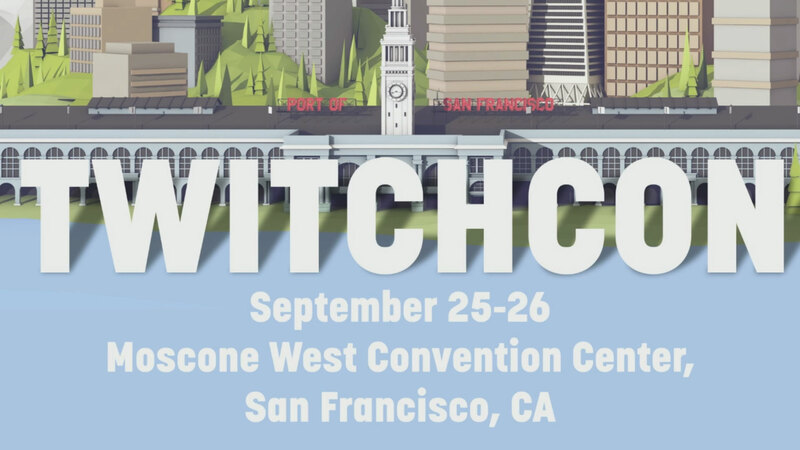 Save the Date: TwitchCon 2015, September 25-26 in San Francisco! The big news which was being teased by Twitch this week has finally been revealed [and you’ll have to do your own drumroll, I’m afraid, blame budget cuts]: It’s the first-ever TwitchCon, and it’s coming this September. Watch the “The Big Announcement”. Conventions, conventions, conventions. Everybody gets a convention. Facebook has F8. Twitter has Flight. Salesforce has Dreamforce. TechCrunch has TC Disrupt. And now, Twitch has TwitchCon. Plans are still underway, and Twitch would like the community’s input on what should happen at the event. A new Twitter account, @twitchconsf, opened moments ago, and Twitch staff will be starting a dialogue there, as well as using the #twitchweekly Twitter tag. There currently isn’t much other information, but Twitch says there will be more details on tickets, scheduling and accommodations in the weeks and months to come. The livestream hosts initially trolled viewers by announcing a purple Twitch hoodie was now available on Amazon, but unfortunately that’s not true. Shame, it was a nice hoodie. Watch the “The Troll Announcement”. Broadcasters and viewers looking for more information can sign up at Twitch’s dedicated hub page. To stay up to date, bookmark our official TwitchCon website, twitchcon.com, and follow us on Twitter, @twitchconsf. SAN FRANCISCO, CA – February 20, 2015 – Twitch, the world’s leading social video platform and community for gamers, today announced TwitchCon 2015, the company’s first ever convention dedicated to Twitch’s community of partners, broadcasters, and viewers. Created as a celebration of all things Twitch, the convention will attract members of the Twitch community from all over the globe. Attendees will have the chance to mingle with each other and their favorite broadcasters, experience live content from the convention center, and learn from the community’s thought-leaders. The event is being co-produced by Twitch and ReedPOP, the largest producer of pop culture events in the world. More details about TwitchCon will be revealed over the coming months including an initial schedule and a call for content. For updates, please visit the TwitchCon homepage and subscribe to the official Twitch Twitter feed. ReedPOP is a boutique group within Reed Exhibitions that is exclusively devoted to organizing events, launching and acquiring new shows, and partnering with premium brands in the pop culture arena. ReedPOP is dedicated to producing celebrations of popular culture throughout the world that transcend ordinary events by providing unique access and dynamic personal experiences for consumers and fans. The ReedPOP portfolio includes: New York Comic Con (NYCC), Chicago Comic & Entertainment Expo (C2E2), Penny Arcade Expo (PAX) Prime & East, Star Wars Celebration, and the UFC Fan Expo. In 2013, ReedPOP added Star Wars Celebration Europe and PAX Australia to its rapidly expanding portfolio of international events. The staff at ReedPOP is a fan-based group of professionals producing shows for other fans, thus making them uniquely qualified to service those with whom they share a common passion. ReedPOP is focused on bringing its expertise and knowledge to world communities in North America, South America, Asia and Europe.